The modern state of Myanmar, also known as Burma, is geographically the largest and westernmost country of mainland Southeast Asia. Its population of approximately 47 million is comprised of more than 100+ nationalities, the largest of which include the majority Bamar or ethnic Burmans, the Rakhine (Arakanese), the Shan, the Kayin (Karen), and the Mon. As a convention in English, members of all of these nationalities receive the designation Burmese as citizens of the country. so much so that even non-Buddhist citizens of the country acknowledge the centrality of Theravāda ethical, social, and political conceptions to the fabric of Burmese life. Burmese chroniclers trace the origin of Theravāda Buddhism in their country to the Buddha himself, who they assert personally converted the inhabitants of Lower and Upper Myanmar. These regions are the respective homelands of the Mon and the ancient Pyu people, precursors of the modern Bamar and the nationalities most closely associated with the evolution of Burmese Buddhism. Burmese sources further equate the Mon homeland with Suvaṇṇabhūmi and the Pyu- Bamar homeland with Aparanta, identifications that allow them to claim for their country 2 missions from King Aśoka (ca. 300-232 B.C.E.). whereas the simultaneous single Aśoka’s mission to Śrī Lanka merely established Theravāda Buddhism on the island for the first time. As a final claim to primacy, the Mon identify the great Pāli commentator Buddhaghoṣa as a native son. Although Theravāda Buddhism has a long history in Myanmar, there is little evidence of its presence in the country before the 4th century C.E. Rather it shows an eclectic mix of traditions that included multiple forms of Buddhism, Brahmanism, and indigenous animist cults. Excavations at the ancient Pyu capital of Śrīkṣetra, for example, unearthed images of Viṣṇu, Mahāyāna Bodhisattvas, and Pāli and Sanskrit Buddhist inscriptions. 7th century Chinese travelogues note that the city supported Sthāvira-vāda (Theravāda), Mahāsaṁghika, Mūla Sarvāstivāda, and Saṁmatīya monks and that the Pyu observed the custom of ordaining all youths as novices in the Buddhist religion. During this early period Myanmar absorbed cultural influences chiefly from South India, though important contacts were also maintained with Śrī Lanka. Beginning in the 9th century, by which time the Bamar had begun to replace the Pyu in Upper Myanmar, Bengal emerged as a major source of Indian influence in the region. Large numbers of Buddhist votive tablets bearing Mahāyāna imagery and Sanskrit inscriptions written in North Indian script were imported and produced locally at this time. Bengali influence waned by the 12th century as a consequence of the Muslim conquest of North India, a development that encouraged the expansion of Burmese ties with Śrī Lanka. The Śrī Lanka connection facilitated the introduction of new reformist strands of Sinhalese Theravāda Buddhism that in time emerged as the majority Buddhist tradition of mainland Southeast Asia. This process proceeded incrementally and did not complete itself in Myanmar until the 18th century. In 1057 C.E., the Bamar king of Pagan, Anawrahta (Pāli, Anuruddha, 1014 - 1077), conquered the Mon kingdom of Thaton in Lower Myanmar, inaugurating the first Burmese Empire (1057-1287). Tradition states that he carried off to his capital Pāli texts, relics, and orthodox monks, and that he adopted Theravāda Buddhism as the sole religion of his domain. To prepare for this, Anawrahta suppressed an already established sect of heretical Buddhist monks known as the Ari, who, though notorious for their wickedness, had enjoyed the traditional support of his forefathers. Whatever the historical accuracy of the legend, epigraphic and archaeological evidence indicates that Anawrahta was more eclectic than portrayed. He assisted the Sinhalese king Vijayabāhu I to reinstate a valid Theravāda ordination line in Śrī Lanka; at the same time he circulated in his own kingdom votive tablets adorned with Mahāyāna imagery. Anawrahta also supported a royal cult of Nat or spirit propitiation dedicated to the very deities said to have been worshipped by the Ari monks. In 1165 the Sinhalese king Parakkamabāhu I reformed the Theravāda Saṅgha of Śrī Lanka by abolishing the Abhayagiri and Jetavana monasteries and compelling all worthy monks to be re-ordained in the Mahāvihāra fraternity. Within two decades, this reformed Sinhalese tradition was established at Pagan and elsewhere in the Burmese empire. 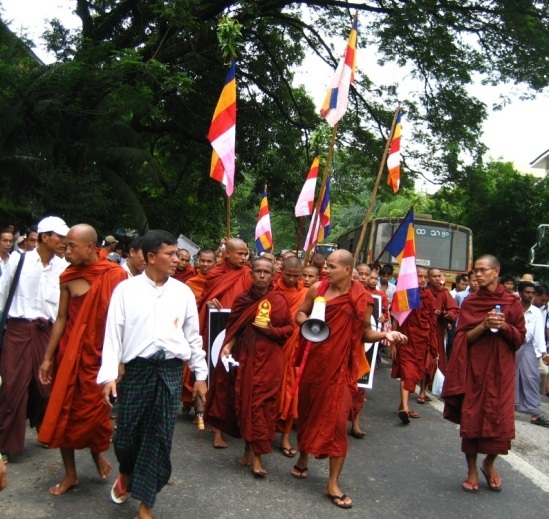 As a consequence, the Burmese monastic community split into 2 groups, an indigenous unreformed faction called the Myanmar Saṅgha, and the reformed Sinhalese faction called the Sīhala Saṅgha. though it fractured repeatedly, giving rise to a pattern of Saṅgha disunity that has been characteristic of Burmese monasticism ever since. Ruins of their headquarters at Minnanthu near Pagan include temples decorated with Mahāyāna and tantric imagery, suggesting that the forest dwellers were votaries of these traditions. and inscriptions indicate that as late as the 15th century the Myanmar Saṅgha received, along with Pāli scriptures and commentaries, Mahāyāna and tantric works as donations to its libraries. The Mon broke away and established the kingdom of Rāmañña in Lower Myanmar, while the Bamar divided Upper Myanmar into several smaller states, chief of which was the kingdom of Ava. The monastic community remained divided throughout the region. In the 14-15th centuries, new waves of reformed Theravāda Buddhism emanating from Śrī Lanka were introduced into Southeast Asia via Lower Myanmar. In 1476 Dhammazedi, the Mon king of Rāmañña, adopted these reforms, compelling all monks in his realm to be re-ordained in the new more stringent Sinhalese Order and to be educated according to a standardized curriculum. Dhammazedi’s reformed Saṅgha was favoured by 2 succeeding Burmese Empires, the Taungoo (1531-1752) and the Konbaung (1752-1885), though rival monastic fraternities were allowed to flourish unmolested. It was during this period of relative stability that the village monastery became the basic institutional unit of the Burmese Saṅgha and assumed its traditional role as village centre and school for village youth. It was principally through this institution, which facilitated literacy and the propagation of a standardized Buddhist ethos, that the cultural integration characteristic of Burmese civilization was achieved. In 1791 the Burmese monarchy ordered Dhammazedi’s reforms imposed uniformly throughout the Empire, thus unifying the Burmese Saṅgha for the first time. all contemporary monastic fraternities in Myanmar trace their lineages back to Dhammazedi’s reforms and share a common interpretation of the monastic code. Buddhism was disestablished as the state religion under the British colonial government (1885-1947) to the detriment of Saṅgha discipline. and has remained in place under both the original democratic government and the subsequent military junta that has ruled the country since 1962. These 3 together (relics, texts, and monks) are the physical embodiments of the Buddha, the Dhamma (Sanskrit, dharma; teachings), and the Saṅgha - the 3 Jewels (Pāli, tiratana) at the centre of Buddhist devotional practice. Within the precincts of every capital were grand pagodas (Burmese, zedi) housing relics that functioned as palladia of the state, and during periods of imperial unity, the shrines of subjugated territories were often restored and embellished as signs of the Emperor’s piety and magnanimity. Myanmar’s most magnificent shrine, the gilded Shwedagon pagoda in Yangon (Rangoon), reached its present monumental dimensions through a process of repeated expansion at the hands of rival monarchs. Since Pagan times Burmese kings took upon themselves the task of promoting monastic learning and preserving accurate copies of the Theravāda Canon - the Pāli Tipiṭaka. The most recent recensions of the Tipiṭaka in Myanmar were produced during 2 Buddhist councils; the 1st convened by King Mindon in 1871 and the 2nd convened by Prime Minister U Nu in 1954. Since at least the 15th century, officially edited Tipiṭakas have formed the core curriculum of state administered monastic examinations. Occupying the centre is the Pāli textual tradition with its beliefs, practices, and institutions as interpreted by the Burmese Theravāda Saṅgha, and supported by the state and the general populace. Prominent among these are the shin-pyu ceremony, the obligatory temporary ordination of boys as Buddhist novices, and the simultaneous ear-piercing ceremony for girls, rites of passage that can be traced back to the Buddhist initiation ceremonies of the ancient Pyu. - both have their origins in Sanskrit Buddhist traditions. The famous water festival of Thin-gyan, which marks the Burmese New Year in April, was adapted from the Hindu New Year festival of Holi, with Buddhist elements taken from Pāli scripture interpolated into the festival’s legend. Considered morally ambiguous at best, Nats may be nature deities or the ghosts of legendary persons who died violent deaths and whose energies can be tapped in exchange for veneration. that tied pre-Buddhist regional deities and their human devotees into a hierarchical web of ritual obligation paralleling the political order. Nat worship often entails the offering of alcohol and blood sacrifice (chickens), for which reason it is regarded even by its votaries as falling outside of Buddhism. Nevertheless the Nat pantheon is conceived of in entirely Buddhist terms and it is situated within the lower strata of the Buddhist cosmos as articulated by the normative tradition. - acts of Dāna (Giving) directed especially toward religious persons and objects, such as monks and pagodas. The goal of merit accumulation is repeated for happy rebirth as a human or god, with Nirvāṇa (Pāli, Nibbāna) or final liberation at most a very distant goal in the mind of the practitioner. The majority of Burmese Buddhists, both lay and ordained, have happy rebirth as their preferred goal, an orientation that has been typical of Buddhists in Myanmar since at least the Pagan period. Vipassanā meditation, when successfully practiced, leads to the attainment of Bodhi (Awakening), or Enlightenment, and Nirvāṇa, either in this life or in a not-too-distant future life. Practitioners of Vipassanā in Myanmar typically meditate privately and join meditation centres (Burmese, wipathana yeiktha) during retreats. The observance of precepts and a general moral lifestyle is considered a necessary foundation for insight practice. Vipassanā meditation was revived in Myanmar in the early 18th century and by the late 20th century was widely popular among all classes throughout the country. 3) The 3rd salvation system is called weikza-lam or the path of the Buddhist wizard: This is an esoteric system of powerful occult sciences requiring initiation by a master. The weikza vows to remain in the world for the benefit of the faithful until the advent of the future Buddha Maitreya (Pāli, Metteyya), at which time the weikza will attain Nirvāṇa or take a vow to become a perfect Buddha himself. As a service, he acts as teacher to human disciples, instructing them in the recitation of spells, the casting of runes, alchemy, and Śamatha (Sanskrit, śamatha) or tranquillity meditation. In its methodology and goals the weikza-lam shows striking similarities to the tantric Buddhist Mahāsiddha tradition of medieval Bengal. Because it proposes an alternative soteriology to that contained in Pāli sources, the weikza-lam is sometimes viewed with suspicion by the religious authorities.